With close and personal access to casinos, hotels, and all that the Las Vegas Strip has to offer in entertainment and nightlife, the Cosmopolitan Las Vegas has everything you're looking for in luxury, high-rise living. 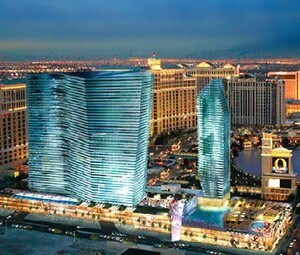 The Cosmopolitan Las Vegas was designed by award winning firm Arquitectonica, and developed by Bruse Eichner. Located centrally on the Las Vegas Strip at 3700 South Las Vegas Boulevard, The Cosmopolitan is in close proximity to the Bellagio Hotel and Casino. Near plenty of shopping and on-the-Strip entertainment, other amenities Cosmopolitan living include: 50,000 sq. foot fitness facility, spa, restaurants, retail space, convention center access, an 1800 seat theatre, and underground parking accessibility. Towering at 61 stories above the Strip, The Cosmopolitan contains 2,600 apartments. Units are designed with 10 foot high ceilings, floor to ceiling windows, large flat screen televisions, huge balconies, resident elevators, and gorgeous views of the Las Vegas skyline and surrounding mountainous areas. Units range in price from $650,000 to over $1,100,000.